En 1968, Gabriele Veneziano, an experienced physician, made an important discovery about elementary particles. This discovery is the starting point of the string theory, a theory which reconciles relativity and quantum mechanics. This theory is based upon the existence of micro strings (of a tiny mass) which form loops that are linked together and interacting as an interconnected network. The string theory questions the very relationship between space and time. These scientific works and the metaphysical questioning they arouse have inspired DEATWIDTH, which is a polymorphic, mulit-artistic and immersive artistic project. This project is definitely rooted in the present, as the past and the future don’t exist. This is a project created to connect sensitive beings and create resistance. A project in which memory brings icons back to life. On both sides of the Atlantic, Julie Fédida aka Nancy Fortune and Eric Bitboy Jr, create, in their respective bubbles, sensitive spaces of freedom, places of resistance, deeply underground, on the bottom and in the form. Their non-rectilinear trajectories now lead them to make common around the project Deathwidth. Discretely recorded on home studio between 2016 and 2017, Deathwidth reproduces the breath of footwork. Reunited under the same banner, Nancy Fortune and 1H9!N set the wild and tense strength of footwork free. Through the 9 tracks of the album whose artwork is signed by Marc Teyssier, they express their feelings about real time ; real time as it was inhabited by Dj Rashad, a pioneer of the Chicago stage who died prematurely in 2014. Crossing the line of 160 BPM, the pair give birth to a rift from which light springs. 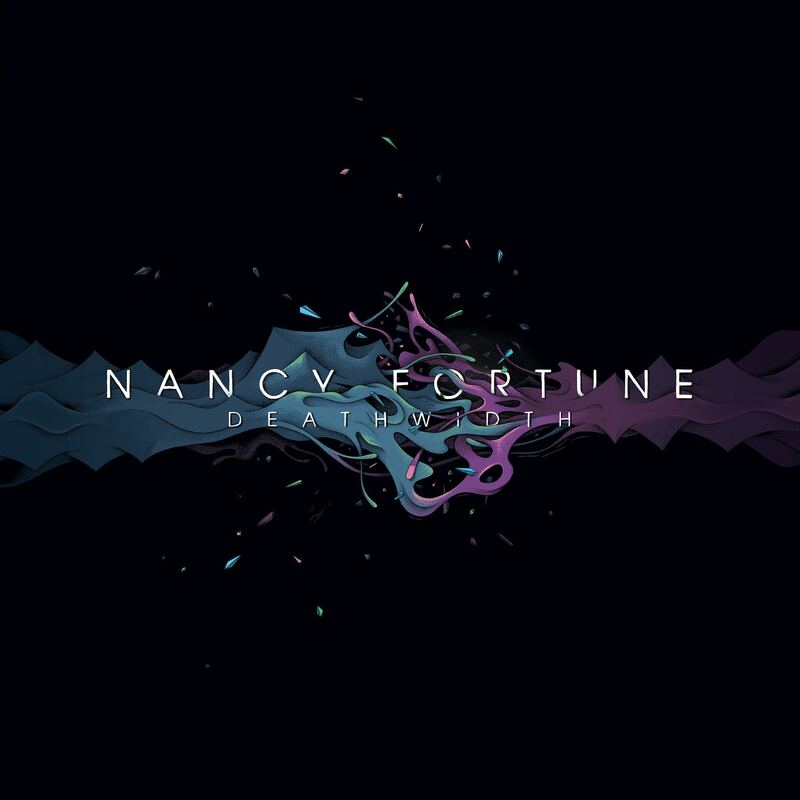 Behing the darkness of the words, Nancy Fortune soothes the pain with her crystalline and ethereal voice, and brings ghosts back to life. Urgency is here, in the present, in real time. Somewhere in the historical center of Clermont-Ferrand, technicians, computer engineers and artists are busy experimenting. The small studio quickly turns into the antichamber of programming and DIY. Completely created in situ, the universe of DEATHWIDTH takes shape: screens on self-supporting structures have been quickly built, there are kinects and mini 3D cameras tracking every form and giving them a new life, analog synths, modified computers… A true geek trap that Super Serge’s expert eye is in charge of spreading on the web. All the planets being aligned, the creature starts taking shape. The immersion becomes possible. Welcoming Eric Bitoy Jr, musical producer and emblematic figure of the Chicago footwork is quite and event. This unparalleled dancer and musical producer has proved his worth during memorable battles. As a member of Creation, a very closed circle of the Chicago avant-garde alongside King Charles (Madonna, Black Eyed Peas), he will take part in meeting and exchange sessions and will host a master class at Centre Georges Brassens, Clermont-Ferrand on Tuesday December 5th. A footbridge between Chicago and Clermont ferrand for mutual enrichment between dancers, culture makers and citizens. The town of Clermont-Ferrand has trusted Nancy Fortune by granting her financial and material support to host the creation of DEATHWIDTH and its streaming release on the web. From December 1st to December 6th « IMAGO », the town’s musical and audiovisual production center, will be the setting of the finalization of DEATHWIDTH. Nancy Fortune (lyrics, machines), 1H9!N (machines) and Eric Bitoy Jr (dance) will get together on stage around an unprecedented stage plan. They will be supported by the technical and technological feats of Jérôme Cartier (sound, 3D and special effects) and Max Dyiab (lights). A first presentation of the creation will be broadcast live on social media on Wednesday December 6th at 4.30 pm (2.30 pm GMT, 9.30 am in Chicago). This is the time when internet users worldwide will be invited to synchronize their watches and vibrate to the first steps of DEATHWIDTH. Real time still. Synchronicity. From spring 2017, the Deathwidth project will be proposed under different forms to festivals, museums… As a complete show, or for DJ’s sets, footwork evenings… A European tour is in preparation. US shows are planned for 2018.